HAND-CRAFTED DESIGNS--CHECK OUT COLORFUL PHOTOS! IF YOU WOULD LIKE TO BE NOTIFIED OF UPCOMING WORKSHOP DATES, OR WOULD LIKE US TO BRING A WORKSHOP TO YOU, PLEASE CONTACT US AT nina@ninalevine.com. Dare to be laughed at and love it! What kind of clown are you? Maybe you’re a bossy clown, a shy clown, a tired clown or a musical one. 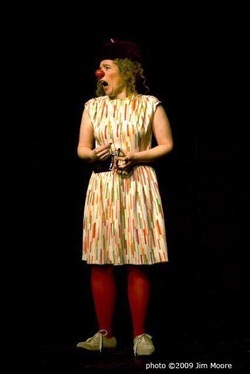 Come find your unique clown character through improvisational games and simple theatrical techniques that bring out silliness. There are group and individual exercises for character discovery. While learning how to share your pleasure with the audience, you will experience the fun of stupidity, the joy of failure, transforming weakness into strength. Best of all, laugh while learning how to make others laugh without really trying. Small class sizes. Registration via email. This introductory-level workshop is open to all adults over 18 and is suitable for non-theatre professionals. Workshops for teens & kids available upon request. HOW DO YOU TEACH SOMEONE TO BE FUNNY? I get asked that question a lot. Simple answer is: I can't! Why not--you may well ask. Because, I say. They are already funny. They just don’t know it yet. Huh? Somewhere inside each and every one of us, there is a clown. Maybe you’ve spilled coffee on yourself in public, or tripped on the sidewalk. What was your response? You looked around to see if anyone noticed (your audience, by the way). You felt silly. That’s your clown: the spiller, the tripper, the one who feels foolish. My job is to transform that public embarrassment into public pleasure. It's a matter of getting past socially-conditioned behaviors and rules, playing with silliness, and sharing that pleasure with the audience. There are techniques for bringing out your clown. First, circumstances are set up to throw you off balance, to confuse. That way, mistakes are inevitable (“no matter, fail again, fail better” Samuel Beckett). When they happen, people often feel silly. The clown learns to enjoy the foolishness and then the audience enjoys it too. Failures are a part of life. Clowns use failure as a tool. Clowns share everything with the audience—skills, expertise, failures, jealousies, striving, longings, dreams, triumphs, you name it. Timing is another thing that can't be taught--only how to become sensitive to it. It is a natural awareness to be recognized and sharpened. I’m not saying any of this is a breeze to master. For the serious professional it can take years. For actors it can be a wonderful tool to enhance character development. However, you don’t have to be a theatre professional at all to participate in a workshop. It is all a game we are playing, and once we remember how to do that and have fun, anyone can awaken their clown. It's a good way to remind yourself not to take life too seriously. By braving the fear of being laughed at and welcoming it publicly, we ultimately discover that laughter is an expression of love for humanity. Please inquire at nina@ninalevine.com or via the Contact Form. A real great comedy mind in panic will find a way out--he's gotta live.